Black is Black.....A Hit Single by the legendary Band Los Bravos. (Click here to Listen). This song takes me back to the times when my parents were young and used to enjoy and dance with us on this along with all other classic pieces. Black as a colour, if I may presume, is a favourite colour for most of the Ladies out there right? Even though I love wearing Colours, black will remain as a favourite colour in my entire life. I found this Black Shirt Dress in one of the online stores and immediately fell in love with it. First of all, because of the colour ofcourse ;), second of all, because of the pattern of the dress. The ruffled short standing-collar already adds elegance to it. The pin-tucked details at the back gives a better fit to the otherwise flowy number, as well as gives a little more detail to the complete black dress. The asymmetrical hemline, being the usp of the dress, finally convinced me to add this beauty to my wardrobe. For a petite frame like me, an asymmetrical hemline is very flattering. It helps to make the legs look more longer and hence gives an illusion of a taller frame. This dress is so comfortable, simple yet so chic on its own, that I am sure I will wear it more often in the coming season. I think it will look great if I add a leather jacket or a cardigan or a coat with stockings or tights and boots or even ankle booties. I will be more than happy, if you would like to share how would you like to style this dress by leaving a comment below. Thank you so much for reading this post...until next time..keep it sylish...keep it functional. Ooooh, lala! This is fancy AND functional! Great wardrobe staple! Lookin' really nice - such a lovely light and I'm really liking the necklace! I love the hi-low hem of this dress and it looks beautiful! Such a pretty dress! Love ur shoes too! Hope you are having a wonderful day! I love that clutch, such a great finishing touch to add to the dress, which you look beautiful in by the way! Hey Jalisa so good to see you here. thank you so much. means a lot. lots of love. sure thing hun. you have an awsome blog. already done. Love you black shirt dress! So gorgeous with the high low hem! 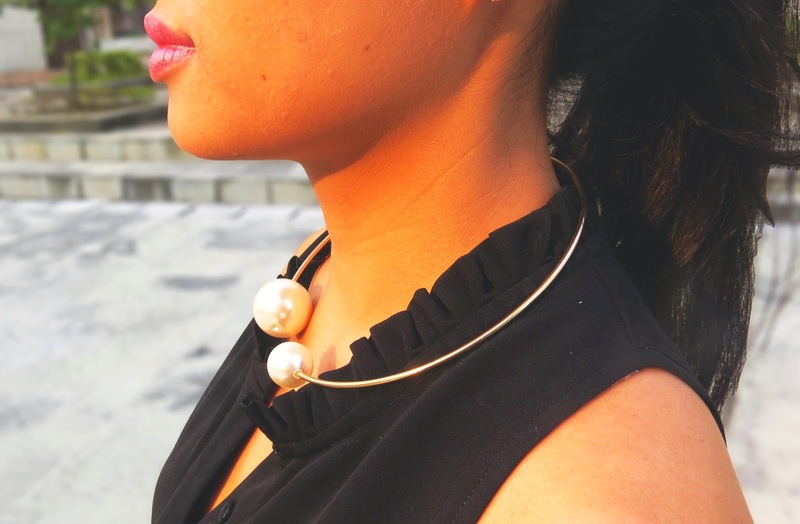 Your bold necklace is such a great statement! Thank you so much Rebecca. you have a great blog. Michaella you too have a great blog with awsome pictures. great content. sure am following you. I love this, it's absolutely gorgeous! So chic but quite relaxed too! Black is definitely a staple for me in my wardrobe. Love this shirt dress, what a great shape and cut. Great post.